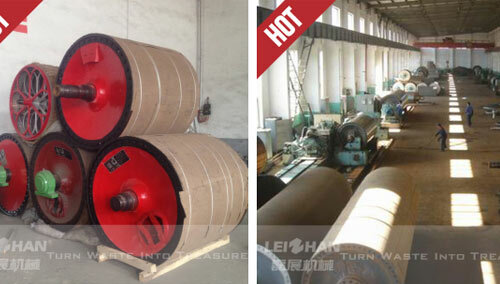 Drying cylinder is a necessary spare part of paper making machine. It is used in drying part of a paper production line. Working with hot steam from steam boiler, dryer cylinder dry wet paper sheets, then the dry paper sheets can be reeled into jumbo rolls. In general, more than 10 dryer cylinders is needed for a paper making machine. Leizhan can supply high quality drying cylinder to satisfy customer’s different demands for different production capacity. The heads and journals of cylinder dryer are made of special cast iron. Separate journals are bolted onto the dryer heads, dryer shells are ground on the outside and turned on the inside, while all dryer journals with steam or condensate pipes have insulation sleeves. The inner surface have grooves for the stationary siphons, the front side ends of all dryers contain manholes.